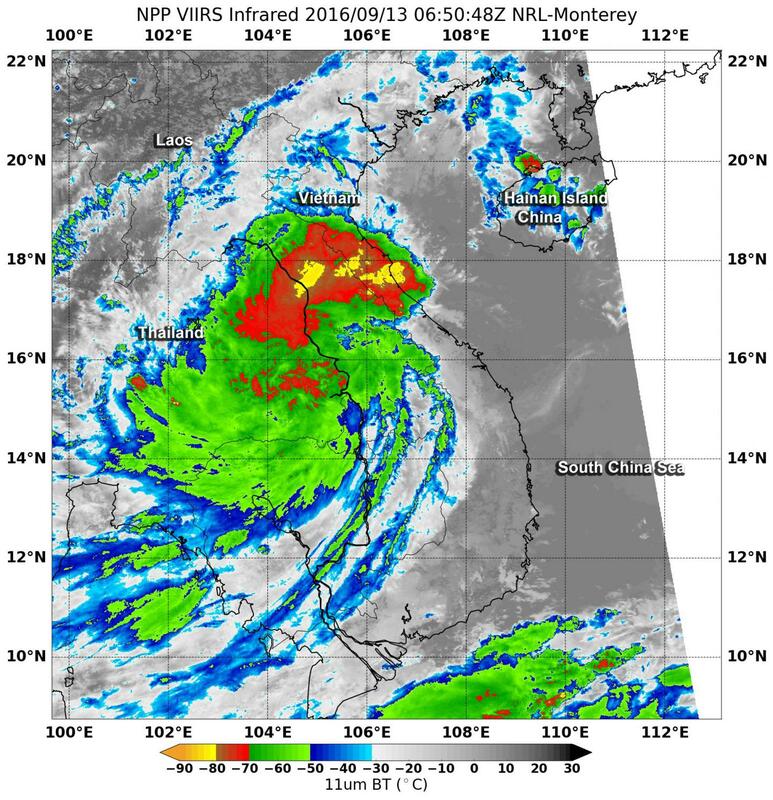 After Tropical Depression 19W moved ashore in central Vietnam NASA-NOAA's Suomi NPP satellite passed over the system and found some powerful thunderstorms over Thailand, Vietnam and Laos capable of dropping heavy rainfall. Tropical depression 19W was renamed Tropical Depression Rai before it made landfall in central Vietnam. At 5 p.m. EDT (2100 UTC) on Sept. 12, the Joint Typhoon Warning Center (JTWC) issued their final bulletin on Rai. At that time, it was 41 miles southeast of Da Nang, Vietnam, near 15.3 degrees north latitude and 108.8 degrees east longitude. Rai had maximum sustained winds near 30 knots (34.5 mph/55.5 kph) and was moving to the west-northwest at 11 knots. On Sept. 13 at 2:50 a.m. EDT (0650 UTC) NASA-NOAA's Suomi NPP satellite passed over Tropical Depression Rai and measured cloud-top temperatures. The Visible Infrared Imaging Radiometer Suite (VIIRS) instrument aboard NASA-NOAA's Suomi NPP satellite captured an infrared image of the storm that revealed the location of coldest cloud top temperatures and strongest storms. VIIRS data showed cloud top temperatures of strong thunderstorms as cold as minus 80 degrees Fahrenheit (minus 62.2 Celsius) were found over central Laos. Temperatures that cold indicate strong uplift in the storm and cloud tops high into the troposphere. NASA research has shown that storms with cloud tops that cold have the ability to generate heavy rain. Strong storms also stretched from central Vietnam through central Laos and into northeastern Thailand. On Sept. 13, Rai was centered over southeastern Laos. The Thailand Meteorological Department forecast said that "the storm is expected to move to the central northeast of Thailand and cause torrential rain with isolated heavy to very heavy rain in many areas of the north and the northeast during Sept. 13 to 15." During the evening of Sept. 13, Rai's remnants are forecast to reach and affect the following provinces: Mukdahan, Amnat Charoen and Ubon Ratchathani before weakening. For updated forecasts, visit: http://www.tmd.go.th/en/thailand.php.